CSUN women’s basketball team lost to San Diego State 58-55 Tuesday night on the road. 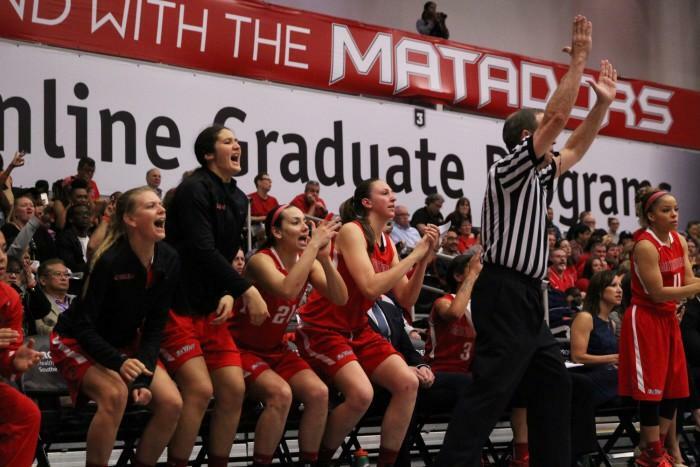 The Matadors trailed by twelve points in the fourth quarter but outscored the Aztecs 16-4. CSUN trailed by one and Serafina Maulupe missed go-ahead free-throws with 36 seconds remaining in the game. which could have potentially won the game for the Matadors. The Matadors called timeout following a pair of free throws from Aztecs guard Khalia Lark with one last chance to tie the game. Maulupe was able to penetrate the defense and find freshman Destiny Brooks for an open three. Brooks after the initial miss was given another opportunity but her shot bounced left as time expired. Brooks finished one of nine from the field and attempted eight three-pointers. Forward Tessa Boagni led the Matadors with 17 points and 10 rebounds. Defending Big West player of the year Channon Fluker finished with 12 points and five rebounds, Maulupe had 11 points, six rebounds, and five assists. The bench for the Matadors had a quiet night only contributed seven points. CSUN was able to use their size to score 18 points in the paint but weren’t able to scored only seven points on 17 turnovers.